Can Laser Vision Correction Help After Cataract Surgery? After cataract surgery, some patients still need glasses or contacts. LASIK and PRK are better at touching up residual nearsightedness, farsightedness, and astigmatism than either lens exchange surgery or piggyback intraocular lens implant placement, both of which require entering the eye again, with the inherent risks associated with intra-ocular surgery. Standard modern day cataract surgery involves taking the cloudy lens out of the eye and replacing it with a synthetic lens implant made of polymethylmethacrylate (what airplane windows are made from), silicone or acrylic. Ideally, a patient’s required prescription power is placed into the implant so that, after cataract surgery, the patient can see well without glasses or contact lenses. In as much as 10% of cases, however, it is not possible to perfectly achieve the ideal result with cataract surgery alone, due to inherent inaccuracies in calculating the power of the implant that is placed in the eye. This is particularly true in eyes that are especially long or short. The vision in many of these eyes can then be fine-tuned after cataract surgery with LASIK or other laser eye surgeries such as PRK, or with further lens-based surgery including exchanging the implant for a new implant with an updated prescription or simply adding a second implant on top of the first implant, which is called a “piggyback” IOL. Studies show that LASIK is the most accurate way to “touch up” cataract surgery. It’s also the safest. In one study, 65 eyes of 54 patients were studied who did not achieve adequate correction after cataract surgery and still needed glasses or contacts. 17 of those eyes were treated by an exchange surgery in which the previous lens implant (IOL) was removed and a new intraocular lens was put in its place (“IOL exchange”). 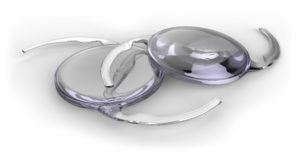 20 eyes had a second implant placed on top of the existing implant (“piggyback IOL”). 28 eyes had LASIK. The results of these three approaches to touching up cataract surgery were compared. 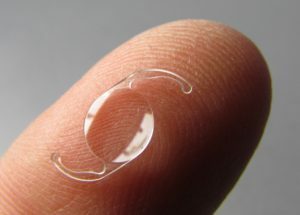 Intraocular lens implants can be placed on top of each other, or ‘piggybacked’, inside the eye. The two lens-based approaches had similar results. 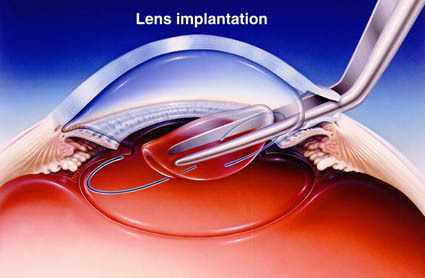 IOL exchange and piggyback IOL surgery produced similar correction of nearsightedness, farsightedness, and astigmatism (“refractive error”). The eyes in which LASIK was used to touch up the cataract surgery result, however, had better overall correction results. In terms of visual outcomes, 62.5% of eyes in the IOL lens implant exchange group were within 1 diopter of the intended result, compared to 82% in the piggyback IOL group and an impressive 100% in the LASIK group. A lens implant made of acrylic material is very small, but can focus light just as well as the natural lens you were born with. The results of this rather tiny study confirm my own experience. Not only is LASIK or PRK more accurate than either intraocular lens exchange or piggyback techniques, but it is inherently safer as well as LASIK or PRK procedures do not physically enter inside the eye, while both of the lens-based techniques do. Keeping surgery limited to the cornea means LASIK or PRK have better safety profiles. The exception, both in this study, and in our experience at Acuity, is in patient’s where there are very large degrees of refractive error. For these rare patients, a lens based technique will sometimes be necessary, since the amount of correction can be outside the effective range of LASIK or PRK. For most patients after cataract surgery, Dr. Vale considers PRK to be a better option to fine-tune vision after cataract surgery, as there is no risk of re-opening the cataract surgery incision as there would be with LASIK. If you’ve had cataract surgery and suspect you need a fine-tuning with laser vision correction, call Acuity Laser Eye and Vision Center today for a free, no obligation consultation!